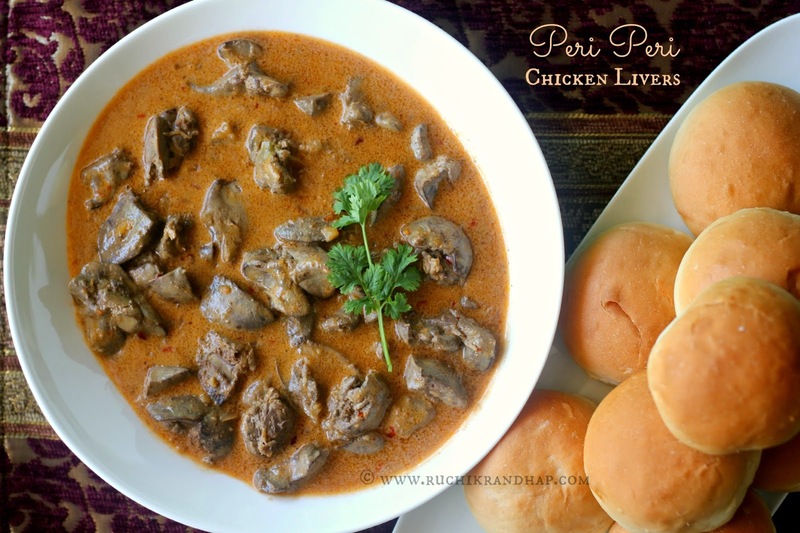 The first time I tasted peri peri chilli chicken livers was at Nandos at the Inorbit Mall, Mumbai a few years ago. Since I was not so fond of livers I ordered the spiced rice and the husband ordered the chicken livers in a thick spicy sauce accompanied by Portuguese bread. I remember quietly stealing some from his plate and finishing almost all of it. We frequented that place many times before it closed down eventually, for lack of business. 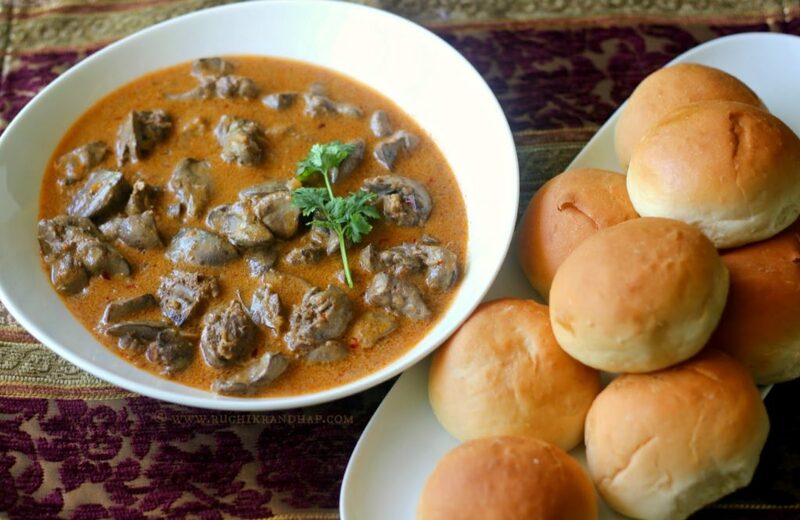 However we never really tried recreating this dish although Roshan did try once but it was around the time when baby#2 was going to arrive and somehow I totally missed to bookmark his recipe for future reference. Now since I like cooking chicken livers at home at least once in two months I was on a recipe hunt. Ever since we ordered some livers from Nandos my son has taken a liking towards it. I grabbed a bottle of Nandos Garlic sauce on my recent trip to the supermarket and the little fellow couldn’t wait until I finished cooking it. He polished it off with some Portuguese rolls within minutes and I barely managed to take a few pictures. This is a cheat’s version because I didn’t make the gravy base/sauce from scratch but it is an easy way to get some delicious food on the table in a few minutes. Perfect for bachelors and novice cooks! Thanks to Nandos for making their sauces commercially available – recreating a dish that is close to their original is now a breeze! 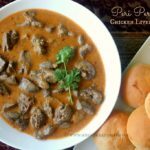 Peri Peri Chicken Livers is a quick way to get delicious food on the table. Perfect for bachelors & novice cooks! Cut the chicken livers into two pieces (they are usually two parts joined together - break the joints and cut each part into two). Wash in a couple of changes of water and drain on a colander for a few minutes. Then marinate them with the salt and keep aside for 15-20 minutes. After 15 minutes boil the marinated livers in hot water for about 3-4 minutes. There will be some froth/foam on top so remove the liver pieces carefully and set aside. Discard the water. Heat oil in a pan and fry the liver pieces by tossing the pan until they harden a bit and turn brownish. Don't stir too much as they may crumble. Remove onto a plate. To the same pan add some extra oil and fry the garlic. Add the butter and the peri peri sauce and simmer for a minute. Reduce the heat completely and add the milk slowly to the simmering paste and stir continuously till the sauce thickens. Do not cover the pan or cook the sauce on a high heat as the milk will curdle quickly. Add a few tablespoons of water to adjust the consistency of the gravy. Add the fried chicken pieces and simmer for another 2-3 minutes. Remove from heat and serve hot with Portuguese bread or dinner rolls. 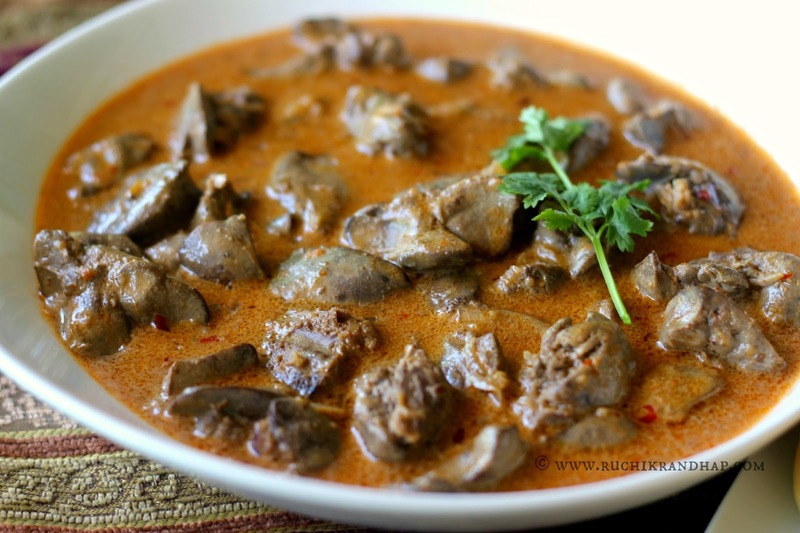 Depending on the livers and the type of sauce used the colour of the gravy could vary from a pale orange to almost greyish black - this however will not affect the taste of the dish. You’ve not used all the ingredients that you’ve mentioned while preparing the recipe. I think you need to edit this recipe. The ingredients has ginger garlic paste and fresh cream neither of which are used in the recipe. Thank you so much. Appreciate this blog. Thanks for the appreciation Sunita!